Sophomore Patrick Harper has been named Hockey East Player of the Week, for the second time this season, after ringing up four assists in BU’s 7-4 win at BC Friday. Shane Bower recorded four points—2G, 2A—in the home-and-home with the Eagles. Jeff Cox profiles 2019 recruit Robert Mastrosimone for New York Hockey Journal. 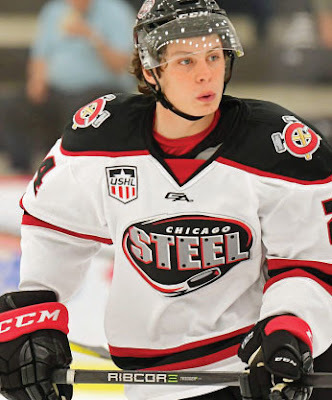 The 5-9 forward from East Islip, NY is in his first USHL season with the Chicago Steel (4G, 6A) after producing 155 points in two season at Shattuck St. Mary’s. He also played in the World Selects Invitational in 2015 and 2016. Nick Bonino scored his fifth goal of the season in Nashville's 5-3 win over the Bruins. Charlie McAvoy's third goal got Boston on the board after the Predators built a 4-0 lead. Alex Chiasson scored his fourth goal in Washington’s 4-3 win against Columbus. ● Recovered from a hand-injury that idled him since the season began and having completed a stint in the AHL (5 goals and 5 assists in eight games), Evan Rodrigues rejoined the Sabres and will skate on their third line. Chris Bourque scored his 10th goal of the season in overtime to give Hershey a 4-3 win against Wilkes Barre/Scranton. Bourque, who also recorded an assist, sits atop the AHL scoring race with 30 points. 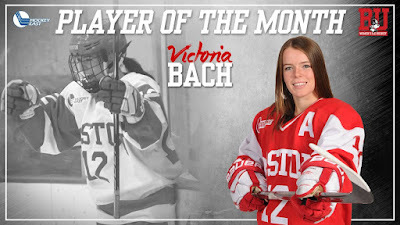 Senior Victoria Bach has been named Hockey East's Player of the Month for November. The forward from Milton, Ontario led the country in several offensive categories over the month of November, including goals (13), points (21) goals per game (1.62), points per game (2.62), hat tricks (2), plus-minus (+17), shots on goal (61), and shots on goal per game (7.62). She posted four multi-goal games, the most of any player in the nation, and found the back of the net 11 times at even strength. She scored two game-winning goals and assisted on another.